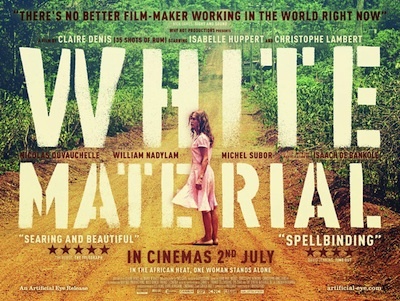 White Material, the latest film from French director Claire Denis, is an elusive, yet intriguing drama about social privilege, personal passion, and the delusions and myopia born out of each. The script, co-written by Denis and Marie NDiaye, uses real-world locations and timely political problems to create an otherworldly narrative, one that takes what is familiar and holds it close even as it smuggles these elements into a place totally separate from any logic we may recognize. 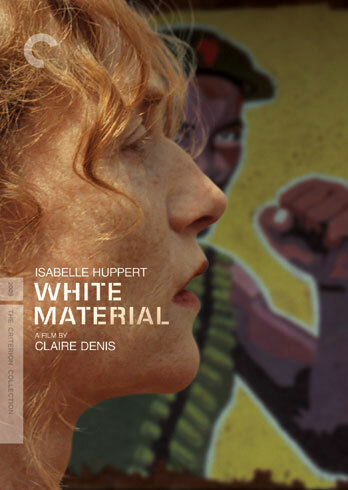 The great Isabelle Huppert stars as Maria Vial, a French citizen living in Africa. She and her husband have been running a coffee plantation for several years, and they have apparently lived on the continent for longer. It's harvest time for their struggling business, but a civil war has caused all of their workers to run off scared. The French government is also pulling out of the region and is encouraging its citizens to do the same. Maria's husband, André (Christopher Lambert), would rather cut his losses and go, even going so far as trying to strike a deal with the local "mayor," Chérif (William Nadylam), to take the land off his hands. Chérif is forming a militia to fight the incoming rebels. This ragtag bunch seems no more or less thuggish than the government soldiers. It's hard to tell which side is which. Maria sticks to her belief that she can get through this, and much of White Material is about her resisting all urgings to stop and finding other workers to replace the ones who left. She is stubborn to any argument that doesn't jibe with her own belief of how things are going, a character flaw she extends to her son, Manuel (Nicolas Duvauchelle). Everyone sees that the teenager is a deadbeat--he spends the first half of the movie locked in his bedroom, refusing to come out--but Maria refuses to hear a negative word said about him. This is a mother's prerogative, I suppose; by extension, she is also mother of the coffee she has been growing, the matriarch of this homestead. She won't give up on her children no matter what. Not even when the rebellion has come through her front gate. The most notorious rebel figure is an enforcer (Isaach de Bankolé) talked about in hushed whispers, either out of fear or awe depending on who you're with. They call him the Boxer, and his wanted posters are large murals painted on the sides of buildings. He is depicted with a belt of machine gun bullets draped over his chest and posed as readying to throw a punch. The image we get of him is different: he is wounded and nearly incapacitated, seemingly only carrying on via an ice-cold determination to not be beaten. He levels no threats at Maria--he doesn't have to. White Material unfolds according to its own internal rationale. Though not exactly plotless, it does not conform to any textbook screenplay outline. Its main drive is for its characters to beat the amorphous deadline that hangs over the war-torn region. Maria must harvest her coffee before the government army comes sweeping through the town, before the Boxer rises up with his rebel soldiers--many of whom are children--to battle for dominance. Denis cuts her film to the flow of dark, ambient rhythms. The music for White Material was composed by the Tindersticks, whose morose melodies have become a staple of her work*. These sinister soundscapes trade airtime with revolutionary-themed reggae music, records spun by a local radio DJ between coded messages to citizens and freedom fighters. He joins a tradition of cinematic AM/FM instigators that includes Super Soul in Vanishing Point [Blu-ray] and Mister Señor Love Daddy in Do the Right Thing. And, of course, real-world wartime propagandists like Tokyo Rose and Hanoi Hannah. The more desperate the situation becomes, the more determined Maria is to finish the job. She hides threats sent to her by unseen enemies and lies to her new workforce. In direct relation to this, Manuel goes further off the deep end, though his intentions aren't clear at first and his true motives are surprising. Essentially, you can't beat them all, so you have to join somebody. The less that Maria can get others to do, the more control wrested from her hands, the harder she pushes back. It takes a tremendous emotional toll on her, and Huppert tip toes around this woman's psychosis so as not to make her seem overly crazy or even all that unreasonable. While she does possess a manic energy, there is a calmness to her single-minded mission that gives her balance. At times, we think that maybe she really can pull this off. But, alas, good intentions disappear in the miasma. As White Material moves toward its climax, the mis-en-scene becomes more choppy, the storytelling more intentionally muddled. The whole region is losing its mind and collapsing in on itself, and so we aren't supposed to know exactly who is doing what to whom. To preserve her isolation, Maria has given over to the savagery that she has been rejecting, and there is no telling what is next for her. A fog doesn't literally roll in, but smoke from a burning fire does add a visual facet to the cloudy metaphor. The conclusion of White Material has an element of the unknowable. Denis is more concerned with the impression it will leave than your literal translation of what you have seen. The haze may not clear, and that may be exactly the point: you can flee these kinds of crises, but they will still be there, never going away. * For those interested, a full boxed set of the Tindersticks music from Calire Denis' films is coming soon. Details here. For a complete rundown on the special features, read the full review at DVDTalk.